I have listed some examples which I have offered at our cooking classes as following. All of these menus are often cooked at Japanese local home. Some of them are originally introduced from China or Europe, but now they have been arranged and seasoned as they fit in Japanese culture and climate. While I listed these menus for your infomation, please don't hesitate to request me to cook the other menus which are not listed below. I would like to organize my lesson flexibly, so it is my pleasure to arrange the class on the basis of your preference. If you have no idea what to cook, I will recommend you some menus after asking you some questions. If you want to cook as many foods as you can, please ask me about intensive cooking class which is completely customized for you. It my need more than one day. Since I am offering Japanese home cooking, it is not possible for you to take the class of Unagi (Japanese eel). Unagi is usually not cooked at home but served only in professional restaurants. Even though it is expensive, I recommend you try once in Japan. Sushi roll: It is typically rolled with Nori which is popular Japanese sea weed. Filling are raw fish and vegetables such as cucumber and avocado. To check the detailed culture of sushi please click here. Fried vegetable, mushroom and seafoods: It was originally introduced by Portuguese more than 400 years ago. It has been developed by Japanese culture and climate during 400 years after introduction and now it is very poplar food at Japanese home. Some times we put it on the rice bowl and that is called Tempura Don or Tem-don. Tempura is also one of the most typical side dish when we eat soba (Japanese noodle). According to the survey by Lifemedia which shows the Japanese popular food ranking for Japanese people, this was chosen as one of the most popular 30 Japanese foods. To check the detailed culture of tempura, please click here. Guest will learn how to operate the knife and prepare the Sashimi from raw fish. I will choose seasonal and fresh raw fish at the fish market. According to the survey by Lifemedia which shows the Japanese popular food ranking for Japanese people, this was chosen as one of the most popular 10 Japanese foods. To check the detailed culture of sashimi please click here. Scattered sushi. Sushi rice mixed with vegetables and seafood. Especially this is cooked on 3rd March every year to celebrate for girls. This day is called Hinamatsuri which is a Japanese Doll festival. We add some seasonal raw fishes and colorful vegetables on the sushi rice. Tuna steak: It is simply baked with garlic and salt. Tuna is one of the most popular fish in Japanese home. This tuna is so fresh that you can eat as sashimi, so you can enjoy medium-rare or rare. Simmered mackerel with Miso. This is seasoned with Japanese typical sweet salty source. Mackerel has been very popular fish for Japanese since ancient age because the Mackerel is easy to fish around Japan all year. Deep-fried fish marinated in a vinegar sauce: As like tempura, this was also originally introduced by Portuguese or Spanish more 400 years ago and it has been developed by Japanese culture and climate during 400 years after introduction. You may find some similarities with escabeche or marinade. 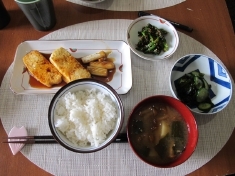 Simmered fish and vegetables: This is simmered in Japanese typical soup which is seasoned with soy sauce, sake and a small amount of sweetening. Japanese chicken fries (soy sauce taste): Small pieces of the chicken are marinated in a mix of garlic, soy sauce and others. Then, it is coated with a seasoned flour and fried in a oil. According to the survey by Lifemedia which shows the Japanese popular food ranking for Japanese people, this was chosen as 4th most popular Japanese foods. a bowl of rice with (soy‐and‐sugar‐seasoned) chicken, egg , and vegetables: Oyako-don means "parent and child rice bowl" in English. The parent is chicken and the child is egg. Both of them are cooked with the sauce (say sauce, mirin and Dashi )and put on the rice together. Baked chicken with shio-koji (salted rice malt): Shio-koji is Japanese traditional condiment which is made from fermented rice and salt. This make the meet and vegetables more soft and tasty. Japanese white cream siteu with chicken and vegetables. Deep Fried pork cutlet: According to the survey by Lifemedia which shows the Japanese popular food ranking for Japanese people, this was chosen as one of the most popular 20 Japanese foods. Japanese crescent-shaped pan-fried dumplings: According to the survey by Lifemedia which shows the Japanese popular food ranking for Japanese people, this was chosen as one of the most popular 20 Japanese foods. 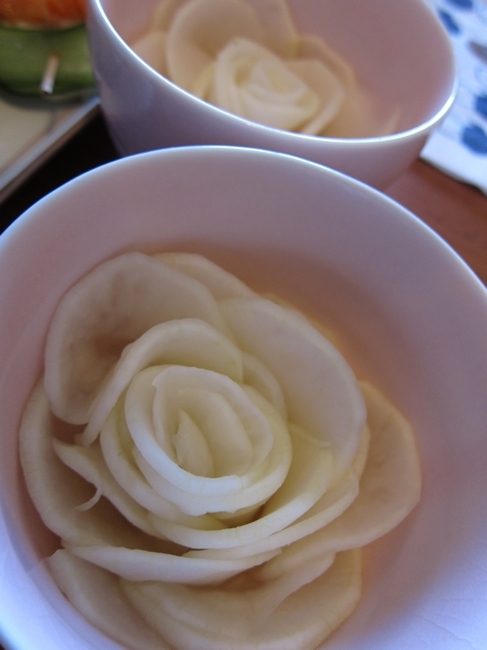 The history and detailed culture of Gyoza is here. Japanese pancake- local speciality of Osaka region: According to the survey by Lifemedia which shows the Japanese popular food ranking for Japanese people, this was chosen as one of the most popular 20 Japanese foods. To check the detailed background of Okonomiyaki, please click here. Japanese egg roll: This is one of the most popular food for Japanese children. Because Tamagoyaki is often put in the Bento, children take it for school excursions every time. Japanese curry: This is totally different from Indian curry in terms of both ingredients and spice. This is also one of the most popular food for Japanese children and men. In fact, according to the survey by Lifemedia which shows the Japanese popular food ranking for Japanese people, this was chosen as second most popular Japanese foods. Omelet with a filling of ketchup‐seasoned fried rice: This is typically loved by Japanese young girls. In fact, according to the survey by Lifemedia which shows the Japanese popular food ranking for Japanese people, this was chosen as one of the most popular 20 Japanese foods. Japanese simmered pork with potato sauce: According to the survey by Lifemedia which shows the Japanese popular food ranking for Japanese people, this was chosen as one of the most popular 10 Japanese foods. We use beef for sukiyaki in our class. It consists of meat and vegetables and other ingredients such as mush room. They are simmered in the mixed sauce of soy sauce, sugar, and mirin. While some Japanese people like to eat sukiyaki with raw egg source, you don't need to use it, if you don't like. At the end of Edo period when Japan was opened to foreigners and started trading with foreign countries, new cooking styles and ingredients such as eating beef and drinking milk were introduced. At that time sukiyaki was the most popular way to serve them. It was a kind of symbol of modern style of cooking. To check the detailed culture of sukiyaki please click here. Japanese rice balls: According to the survey by Lifemedia which shows the Japanese popular food ranking for Japanese people, this was chosen as one of the most popular 20 Japanese foods. Japanese pancake- local speciality of Osaka region: According to the survey by Lifemediawhich shows the Japanese popular food ranking for Japanese people, this was chosen as one of the most popular 20 Japanese foods. To check the detailed background of Okonomiyaki, please click here. since 2011-07-17 / Copyright Musubi CO., Ltd. All Rights Reserved.